This very moment, WE Architecture is particpating as an acting member of the jury in the Rigenerare Corviale competition in Rome, Italy! WE are proud to announce that our team consisting of H. Skjøde Knudsen, WE Architecture, Friis & Moltke, Alectia and SLA has been prequalified for the competition to build the new Campus Roskilde in Denmark. WE architecture is officially participating in the Venice Biennale 2016! WE are very proud to announce that the Danish curators Kristoffer Lindhardt Weiss and Boris Brorman Jensen have chosen us to participate in the Venice Biennale 2016 in Italy! This very moment, the pressure on especially the youth housing market is increasing with rapid pace due to the centralisation of educational institutions and workplaces as well as the increasing urbanisation in the society. WE would like to share the great news that the old Haderslev Hospital in Denmark will shelter refugees and function as a temporary reception centre. In our task group WE have previously worked on the idea of Haderslev Hospital functioning as a reception centre for refugees in the future. WE are proud to announce that we have been prequalified for a new project on Sydhavnen’s Resource Centre located in Copenhagen, Denmark! 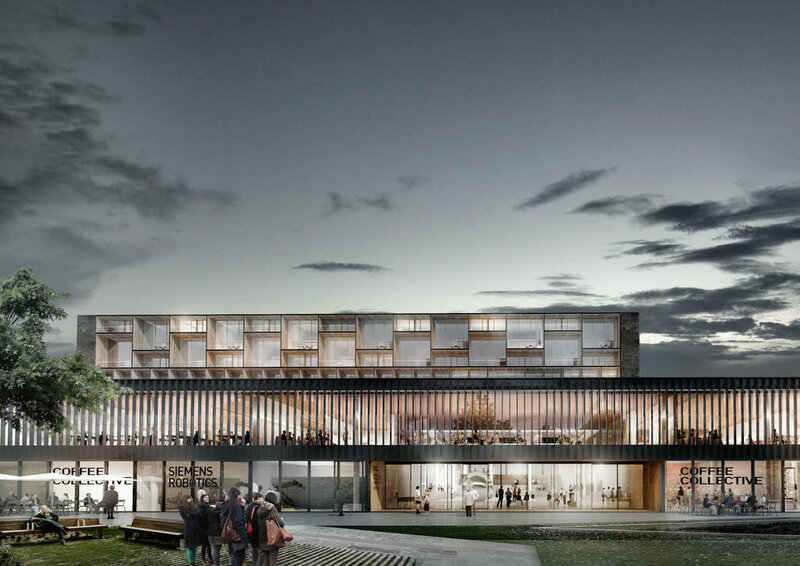 WE Architecture is proud to announce that WE have been prequalified for a new project on Gråsten Care Centre in Sønderborg Municipality in collaboration with GPP Arkitekter, MOE and Landskab Aarhus! WE Architecture has been selected as one of three winners in the first phase of the new psychiatric hospital competition in Ballerup, Denmark. WE architecture, together with Creo arkitekter, Oluf Jørgensen A/S and Terra Nova Landskab, is prequalified for the new Psychiatrical Hospital in Ballerup. WE are excited about the assignment and are looking forward to the collaboration! The competition site is located at one of the most beautiful nature settings in Denmark at Limfjorden in Northern Jutland. The surroundings offer a unique possibility to give all housing units a spectacular view of the fjord. One of the main challenges is how to fit the new structure in the extraordinary nature settings without obstructing it. The competition is in collaboration with Skala Arkitekter, Balslev Rådgivende Ingeniører and BY+LAND. WE are excited about the task and cannot wait to get started! Topping-out ceremony of Mariehøj Cultural Centre in Holte, Denmark! WE Architecture has been prequalified for the competition Teglhuset. The competition is a community housing project for people with psychiatric disabilities in Helsingør Municipality, Denmark. The competition is in collaboration with SKALA Arkitekter, OBH Gruppen and MASU planning. WE are excited about the assignment and look forward to the collaboration! WE Architecture is mentioned as one of the "five Danish architects to keep an eye on" by Danish™! WE are lecturing in Finland! Join us for the 13th Alvar Aalto Symposium DO! on 7 August to 9 August in Jyväskylä. We are lecturing about digital design as a tool in architecture processes under the theme DO DIGITAL! alongside Greg Lynn, Eero Lundén and Lisa Iwamoto. The lecture is Saturday 8 August at 2.30 pm. The Swedish magazine RUM has featured Mariehøj Cultural Centre with the headline "A STRIKING FRAME"! WE architecture in the jury for the competition "User-generated Kyiv"
The recently announced 'User-Generated Kyiv Ideas Competition' is searching for creative ideas and architectural solutions on building a better city. WE Architecture is in the jury alongside Ai Weiwei, Haris Piplas, Heribert Wolfmayer, Stefano Regazzo. Go join and participate! WE Architecture is happy to announce that WE in collaboration with Danish architecture studios Polyform and Transform have been invited to develop visions for the re-use of the 60.000 m2 former hospital in Haderslev, Denmark. WE Architecture aims at being precise and communicative in all phases of the creation of architecture and design. This is why we offer what we call safe innovation through visual construction. Safe innovation through visual construction means communicating and discussing architecture through 3D rendering through all stages of the design process, both internally and with our clients. We do not guess and do not make our client guess. Instead we materialise our visions through lively visuals. Safe innovation through visual construction ensures that the exact ideas and visions of our clients and WE Architecture are realised.